Department of Computer Science and Engineering, Univercity College of Engineering JNTUK. 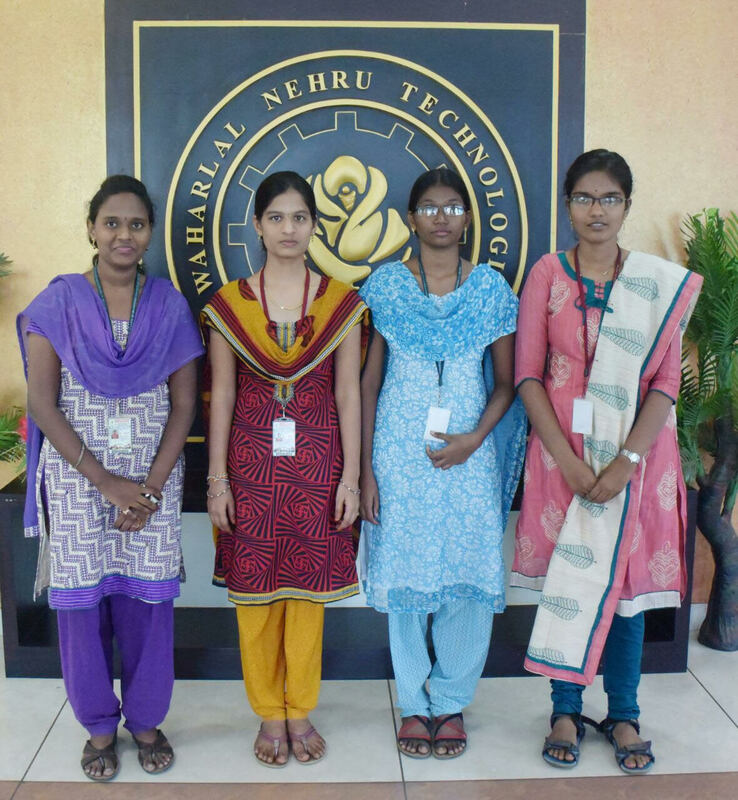 The Department of Computer Science and Engineering, JNTU College of Engineering, Kakinada was established in the year 1990. The PGDCA Program was initiated in the year 1987 - 1988 and was the first Computer Oriented course to be offered. This course was initially started in the ECE Department. 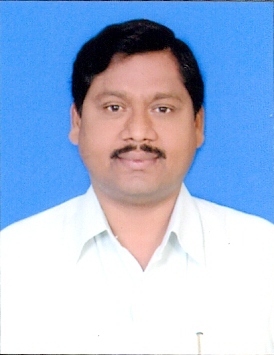 In the year 1989 - 1990, B.Tech. 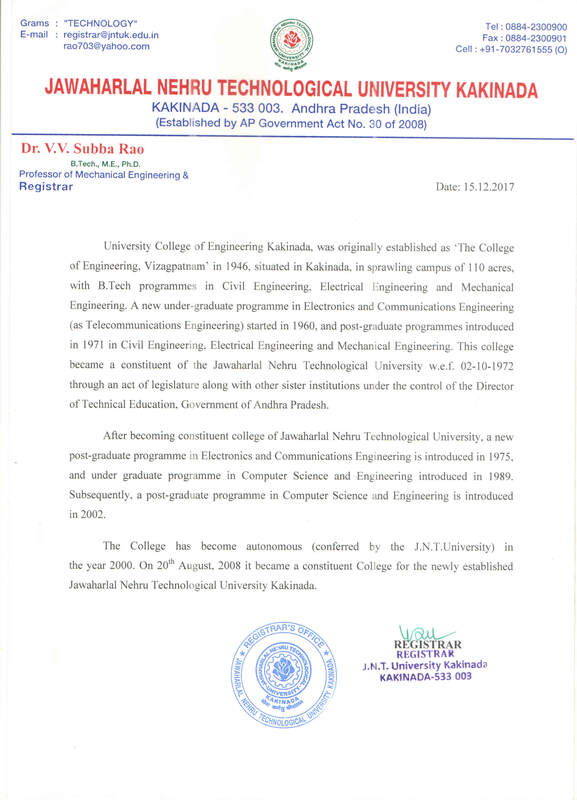 Program in Computer Science and Engineering was started and was the second computer-related program, which was also offered from the ECE Department for that year only. Later, after the establishment of CSE Department separately in 1990, it continued to offer the above-mentioned two courses. From 1996, M.C.A. program was started, from 2000-2001 M.Tech. (Full time) and from 2001-2002. The Academic Programmes for B.Tech., M.Tech. and M.C.A. are being updated/modified every two/three years to meet the needs of the industry. The Board of Studies in CSE consists of 2 eminent professors from other universities and 2 well known industrialists apart from 4 professors within our institute. Thus, our academic programs are more need based rather than completely theory-oriented. This department is equipped with the state-of-the-art computer laboratories and laboratories required to cater to the needs of undergraduate and post graduate programmes. In addition, active research is conducted in the realms of modeling, engineering and understanding of software systems related to distributed, cognitive, security, language engineering, databases, wireless networks, web services, cognitive informatics and computer ergonomics domains of computing. The Alumni of this department are occupying high positions in Multi-National Companies like Microsoft in India and abroad, and software tycoons like TATA Consultancy Services (TCS), Satyam, and Infotech etc. The department organized successfully several National seminars, Workshops, and Conferences. Most of the students of this department are securing the jobs in reputed National and International organizations through on and off campus recruitments. This department is actively involved in modernizing and developing the laboratories with World Bank project, Technical Education Quality Improvement Programme. All laboratories, which are useful for undergraduate programme are strengthened by procuring necessary equipment to conduct various experiments and projects. In addition, new laboratories in the area of Software Testing, Internet Technologies, Programming Languages and Data Engineering are developed to cater to the needs of existing programmes. However, these facilities are to be augmented further with new equipment to improve the facilities and to offer new post graduate programmes. In addition, new faculty members (having expertise to teach advanced subjects) are to be recruited. Building space is to planned and obtained for the new courses. Library books have to be procured as per the new PG programmes to be offered. Presently, the faculty of this department has expertise in various advanced fields in the state-of-the-art technologies like Data Mining, Image Processing, Information Security, Computer Networks, Cloud Computing, Social Network Analysis and Internet Of Things. The department aims at promoting industry oriented research. It has MoU with TCS Ltd, Chicago State University and Loment Technologies Ltd., USA for joint research collaboration. Department of Computer Science and Engineering strives rigorously to create intellectual academic environment with global standards that fosters the search for new knowledge in a highly dynamic computing-centric society through applied research. M1: To provide quality education in both theoretical and applied foundations of computer science and train the students to solve the real world problems effectively thus enhancing their potential for high quality careers. M2: To facilitate the students and faculty to inculcate the research culture to advance the state- of-the art of computer science and integrate research innovations in multi-disciplinary fields. M3: To equip students and faculty with excellent teaching-learning capabilities through advanced learning tools and technologies. M4: To produce students with critical thinking and lifelong learning capabilities for applying their knowledge to uplift the living standards of the society. M5: To produce students with enriched skill set, professional behaviour, strong ethical values and leadership capabilities so as to work with commitment for the progress of the nation. PEO 1: Competent IT professional with sound fundamental and applied knowledge in Computer Science and Engineering. PEO 2: Sustained learner to bring out creative and innovative ideas to meet the challenges of industry and society with ethics and human values and pursue the higher studies. PEO 3: Entrepreneurs in computer science acquainted interpersonal, managerial skills to make them successful in multidisciplinary fields. PEO 1 : Competent IT professional with sound applied foundations rendering solutions in the areas of computer science and engineering, expertise to the challenging industrial and societal needs in an effective manner with ethics and human values. PEO 2: Sustained learner to bring out creative and innovative ideas by addressing the research issues/ to serve as faculty for engineering education. PEO 1: To produce IT professionals with in depth knowledge in software design, programming and analytical skills to cater the challenging industrial and societal needs in an effective manner with ethics and human values. PEO 2: To produce Sustained learner to bring out creative and innovative ideas by addressing the research issues to serve as faculty for IT education. PEO 3: To produce entrepreneurs in IT with good interpersonal and managerial skills to survive in multidisciplinary fields. PO 1: Acquire in-depth knowledge of core discipline such as Algorithms and data strictures, databases, networking, mobile applications and security. PO 3: Solve and arrive at optimal solutions for societal and environmental problems with core expertise and lateral thinking. PO 4: Develop higher order thinking and innovative ideas to solve unknown problems through the application of appropriate methods, techniques and tools. PO 6: Obtain knowledge in cutting edge technologies to contribute positively towards collaborative multidisciplinary problem solving. PO 7: Acquire leadership skills and project management techniques to manage projects efficiently to work in teams. PO 8: Present their knowledge and ideas effectively in any technical forum through the effective design of documents and reports. PO 9: Engage in lifelong learning independently with commitment to acquire knowledge of contemporary issues to meet the challenges in career. PO 10: Realize professional and ethical responsibility and act in accordance to social welfare. PO 4 : Develop higher order research skills and innovative ideas to solve unknown problems through the application of appropriate research methodologies, techniques and tools. PO 6: Obtain knowledge in cutting edge technologies to contribute positively towards collaborative multidisciplinary scientific research. PO10: Realize professional and ethical responsibility and act in accordance to social welfare. PO11: Examine mistakes critically and learn to make corrective measures by self assessment. PO 1: The student shall possess fundamental and advanced knowledge of core discipline such as networking and security, programming and computing and other IT applications. PO 2: Design and implement web enabled solutions for Information Technology problems with the usage of different software design paradigms and patterns. PO 3: Develop higher order research skills and innovative ideas to solve unknown problems through the application of appropriate research methodologies, techniques and tools. PO 5: Obtain knowledge in cutting edge technologies to contribute positively towards collaborative multidisciplinary scientific research. PO 6: Acquire leadership skills and project management techniques to manage projects efficiently to work in teams. PO 7: Present their knowledge and ideas in any technical forum through the effective design of documents and reports. PO 8: Engage in lifelong learning with commitment to acquire knowledge of contemporary issues to meet the challenges in career. PO 9: Realize professional and ethical responsibility and act in accordance to social welfare. PO10: Adopt Self learning abilities so as to educate or to guide others. UCEK is proud to announce four students from department of CSE got selected for the University Innovation Fellow Program offered by Stanford University, USA.